For this 3 year project the Trust appointed a “Growing Food for the Future Officer” who worked with schools in the Tees Valley area helping them to develop growing food projects in their schools. The project worked with schools and local communities to manage land sustainably for growing food locally and also promoting awareness and understanding of the links between food and healthy lifestyles. 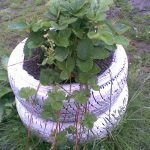 To work with schools in the Tees Valley area to develop and promote growing food and composting activities and use these as examples of good practise. To create one job – “Growing food for the future officer” for the duration of the project. To work with 30 school per year to develop an out of school learning opportunity linked to local food. The Trust has been working with other partners on Neighbourhood Renewal funded projects encouraging and supporting schools to become more sustainable and to become Eco-Schools. 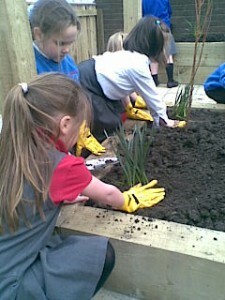 As part of this the Trust has been helping schools to develop wildlife gardens. Many of the schools would like to continue with this work and are now interested in creating areas for growing food and linking these to their wildlife gardens. The schools already have pupils involved in eco-school action teams and growing food is something that has regularly appeared on the school action plans. The schools are keen to do work linked to growing food but lack the resources and expertise; this project will go towards providing these. The project will be based in the Tees Valley and cover four local authorities with whom the Trust has good contact – Redcar and Cleveland, Stockton on Tees, Middlesbrough and Hartlepool. These authorities have areas which areas which have been identified as of particular social, economic and environmental need. This need has been identified through the Index of Multiple Deprivation and eligibility for funding through programmes such as Children’s Fund, European Objective 2 and Neighbourhood Renewal. All schools had the support of the Growing Food for the Future Project Officer. The initial support was intensive; this was followed up by email/telephone and further visits if required and further support is being provided through our Supporting impact and change project. Initially as part of the project school were asked to make a cash contribution to the project as match funding requirements and also as a way of encouraging buy into the project this was removed at the later part of the project as it became increasingly difficult to get school to contribute money. Some schools used the project to kick start further developments in the school grounds and in total school spent £45556 through this project. The project is now in its final stage and this involves putting together a 5 year business plan to make the project sustainable.